Palm Cafe is a modern coffee shop with a unique store design. At Palm Cafe, besides its already well-known Shakes, we offer a wide range of drinks featuring premium coffee, coffee blends such as lattes, frappes, hot chocolate, tea and herbals. If your prefer to have a bite, our selection of paninis, delis, wraps, burgers, tacos, hot dogs, sandwiches, crêpes, waffles or pancakes could be your option. We also provide a healthier range of options such as fresh salads and natural fruit juices, where you can choose among many bases, ingredients and add-ons. Palm Cafe City es un formato ampliado de PALM CAFE, donde además de tener una carta más extensa, el servicio se realiza en mesa. Este concepto cuenta con entrantes tales como los PALM CAFE Nachos además de una amplia selección de hamburguesas, patatas fritas de varios tipos, perritos calientes (Dogs) y sándwiches. 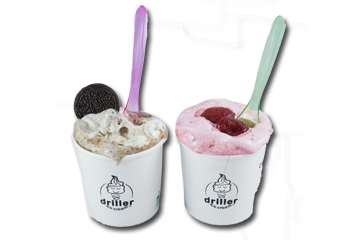 At Driller you will enjoy watching how your ice cream is elaborated with the ingredients and sauce that you chose. Made with Soft Ice Cream, you will just have to choose your base among Nutella, dulce de Leche, peanut butter, nougat sauce, blueberry sauce, strawberry sauce, etc. which will be blended with your selection of Oreo, Chips Ahoy, M&M´s, Kit-Kat, Twixx and many more.